As a part of the G20 meetings taking place in the Belek Tourism Zone in Antalya, a memorandum of understanding was signed between the World SME Forum and OECD. Signing the memorandum were TOBB President and B20 Chair M. Rifat Hisarcıklıoğlu, OECD Secretary General Angel Gurria and the International Chamber of Commerce (ICC) Secretary General John Danilovich. 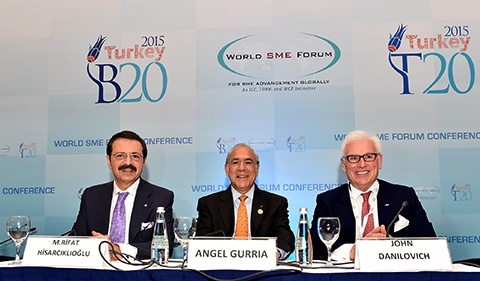 In his keynote speech, “B20 China SME Agenda,” TOBB President and B20 Chair M. Rifat Hisarcıklıoğlu stated that the World SME Forum is a first for both G20 and the world; that it will act as the voice of all SMEs. Stating that this will enable SMEs to present a consolidated and unified voice on the global scale for the first time, Hisarcıklıoğlu said that the World SME Forum is an inclusive global representation mechanism. Pointing out the fact that the forum is a non-profit, Hisarcıklıoğlu stated that the organization’s mission is one of research, consultancy, protecting the rights of SMEs on a global scale as well as connecting the SMEs of various countries. Stressing the importance of SMEs for Turkey, Gurria emphasized that they are trying to integrate SMEs into the global value chain; stating that this is possible only through increased use of technology. B20 China Sherpa Yu Ping stated that Turkey’s B20 Term has been very successful, that the policies put forth have been very inclusive and the SMEs voice is heard much louder. Ping stated that their priority for the G20 summit to be held next year under China’s chairmanship will be to preserve the work Turkey has achieved with B20, promoting growth of commerce and investments in the global economy, development of the infrastructure to increase the productivity of economic and financial governance as well as the promotion of inclusive and compliant growth through mutually beneficial cooperation.